The present retrospective study evaluates the long-term results of reconstructive periodontal surgery using a bovine-derived bone mineral with or without a bio-resorbable collagen membrane. Teeth (241) in 54 patients were treated. Treatment was performed regardless of the patients' genetic predisposition, medical status or social habits. 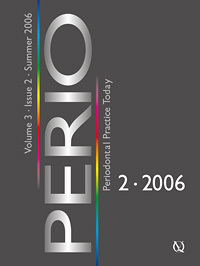 The patients had to follow a strict oral hygiene programme prior to periodontal surgery. One year after treatment, an overall reduction of the mean pocket probing depth (PPD) of 2.69 mm on average (from 6.88 ± 1.89 mm to 4.19 ± 1.40 mm) and an increase in clinical attachment level (CAL) of 3.14 mm on average (from 8.56 ± 2.39 mm to 5.42 ± 1.50 mm) could be shown. At two years from baseline, no statistical differences in PPD reduction were found compared to the one year's data. Within the limits of the present study, it can be concluded that periodontal surgical therapy by the use of bovine-derived bone mineral with or without a bio-resorbable collagen membrane in combination with a strict oral hygiene program results in significantly high PPD reduction and CAL gain. Thus this treatment appears to be a suitable treatment for severe periodontal defects, leading to predictable and stable results. Leung, W. Keung/Jin, Lijian/Söder, Birgitta/Corbet, Esmonde F.
In the present study, detection patterns of subgingival Porphyromonas gingivalis (Pg), Prevotella intermedia/nigrescens (Pi/n), Tannerella forsythia (Tf) and Treponema denticola (Td) were analysed, using commercially available species-specific DNA probes (DMDX/PathoTek, Switzerland) in 16 untreated periodontitis patients (5-7 non-adjacent sites per subject) before and one month after mechanical non-surgical periodontal therapy. The detection patterns of the pathogens at the two time points were studied using configural frequency analysis (CFA) and Stuart-Maxwell χ2 test. All subjects showed favourable clinical treatment responses. Prevalence of all microbes followed was significantly reduced after treatment. CFA identified: (i) two statistically significant configural types at both time points: co-detection of Pg, Pi/n, Tf, Td, and none of the four pathogens detectable (Holm's criteria p = 0.003); and (ii) one statistically significant configural anti-type post-treatment: reduced detection pattern of Pi/n alone (Holm's criteria p = 0.004). For many of the pre-treatment sites with Tf, Pg, Pi/n, and Td configural type, all these periodontopathogens were undetectable one month after treatment (p < 0.001, McNemar's post hoc analysis with Bonferroni adjustment). Within the limitations of this study, the results indicated a co-detection of subgingival periodontopathogens Pg, Pi/n, Tf, and Td. Analysis of the subgingival colonisation of these microbes might be a useful adjunct in the assessment of periodontal therapeutic outcomes. Both periodontopathogens and destructive host response play important roles in the pathogenesis of chronic periodontitis and ideal therapy must address both components. Therefore, management of the disease may require additional interventions that will modulate the host response, for example by the use of non-steroidal anti-inflammatory drugs (NSAIDs). The present study was designed to evaluate the efficacy of adjunctive ibuprofen clinically and also biochemically by detecting gingival crevicular fluid (GCF) matrix metalloproteinase-8 (MMP-8) and prostaglandin E2 (PGE2) levels, in the treatment of chronic periodontitis. Twenty chronic periodontitis patients were randomly placed in two groups. The control group received initial periodontal therapy, while the test group additionally received systemic ibuprofen for two weeks. Plaque index (PI), sulcus bleeding index (SBI), probing pocket depth (PPD) and relative attachment level (RAL) were recorded and GCF samples were obtained at the first, third and sixth months following therapy. GCF levels of MMP-8 and PGE2 were evaluated using enzyme immunoassay technique. Treatment outcomes were analysed by Mann-Whitney U test for treatment modalities and Wilcoxon signed rank test for changes within each group. Both groups showed significant improvements in all parameters following therapy (p < 0.05). The comparisons between the two groups revealed that neither mean PI scores, nor the improvements in SBI, PPD, RAL or GCF MMP-8 and PGE2 levels demonstrated statistical significance (p > 0.05). Adjunctive use of systemic ibuprofen demonstrated no beneficial effect on the clinical or biochemical outcome of periodontal treatment of chronic periodontitis. The lack of beneficial effect may be due to short period usage of ibuprofen. Pontes, Ana Emília F./Palioto, Daniela B./Novaes jr., Arthur B./Souza, Sérgio L. S./Taba jr., Mário/Grisi, Márcio F. M.
Background: The aim of this study was to evaluate the influence of bioactive glass (BG), with or without enamel matrix derivative (EMD) in the treatment of class II furcation lesions. Methods: Experimental furcation defects were surgically created on mandibular P2, P3 and P4 of 6 mongrel dogs, and filled with gutta-percha. Four weeks later, the defects were debrided, the roots were planed and notches were placed at bone level. Each tooth was randomly assigned into BG+EMD, BG or internal control group. The animals were sacrificed 12 weeks later. Results: The results for the groups control, BG and EMD+BG were, respectively: extension of new cementum (ENC), 49.55 ± 15.43%, 84.01 ± 7.87%, 91.96 ± 5.69%; epithelium extension (EE), 27.00 ± 23.89%, 4.79 ± 6.98%, 1.89 ± 2.47%; extension of connective tissue (ECT), 23.44 ± 9.09%, 11.20 ± 4.87%, 6.15 ± 5.19%; bone fill area (BFA), 51.15 ± 9.23%, 74.97 ± 9.02%, 76.53 ± 4.48%; mineralised bone (MB), 40.15 ± 9.95%, 31.65 ± 15.61%, 37.64 ± 16.25%; and bone marrow (BM), 11.00 ± 3.91%, 32.05 ± 14.61%, 31.13 ± 15.25%. The area of residual bioactive glass particles in the BG group was 11.28 ± 6.81%, and in the BG+EMD group was 7.76 ± 3.14%. No statistical differences (p > 0.05) were observed in any parameter between BG and BG+EMD groups, and between BG and internal control. However, comparing the BG+EMD group with the internal control group, statistically significant differences were observed concerning ENC and ECT (p < 0.05). Conclusion: Within the limits of the present study, it can be concluded that BG and BG+EMD have the potential to improve periodontal regeneration, and that the association seems to favour the cementum formation. Tipton, David A./Pabst, Michael J./Thomas, Edwin L./Babu, Jegdish P./Stein, Sidney H./Fry, Hiram R.
Background: Aggressive periodontitis (AP) encompasses a group of highly destructive forms of periodontitis. Its pathogenesis may be related to alterations in inflammatory and immune responses and in the oral flora. Methods: A 16-year-old Black female patient presented with chief complaints of gingival pain and tooth mobility. She received a complete clinical dental examination, full mouth periapical radiographs, and laboratory tests including complete blood count, comprehensive metabolic panel, and microbiological plaque analysis. In vitro studies included salivary analysis and neutrophil and monocyte response to lipopolysaccharide (LPS). Results: The patient had severe generalised gingival inflammation, type III tooth mobility, 8 to 10+ mm pocket depths, and extreme, generalised alveolar bone loss. Blood analysis revealed chronic non-cyclic neutropaenia, monocytosis, and slightly elevated protein levels. Subgingival plaque contained high levels of Prevotella intermedia/nigrescens (P.i.) (~50%) and Porphyromonas gingivalis (P.g.) (~15%). The patient's neutrophils and monocytes produced superoxide and interleukin-1ß normally in response to N-formylmethionyl-leucyl-phenylalanine and E. coli LPS, and the neutrophils attached and migrated normally. Prevotella LPS had lower neutrophil priming activity than Actinobacillus actinomycetemcomitans or Fusobacterium nucleatum LPS. Salivary protein, and myeloperoxidase and lactoperoxidase activities were elevated. Conclusions: This report supports others associating P.i. and P.g. with AP. The high levels of P.i. in the plaque are of particular interest, because P.i. LPS had low ability to prime neutrophils. This excessive growth of P.i. and P.g., coupled with low numbers of normally functioning circulating neutrophils, may have contributed to the development of AP. Patanwala, Alifya/Fisher, Edward W./Chapple, Iain L. C.
Plasma cell gingivitis is a condition, thought to represent a hypersensitivity response, which affects the gingival tissues, usually in the anterior maxilla, where it often appears as an asymptomatic, diffuse, erythematous and papillary lesion which bleeds readily with minimal trauma. The aetiology is often difficult to elicit but may be related to specific allergens, neoplasia or it may be of unknown origin. Many cases have been reported in the literature over the last 4-5 decades, related to a variety of aetiological factors, and at one point it was thought to have disappeared until further cases were subsequently reported. The reported case was a 41-year-old female who was referred to the department with bleeding gingivae by her general dental practitioner. She underwent routine examination and clinical investigation, which did not reveal anything abnormal. Biopsy of the palatal mucosa showed the specimen to contain a plasmacytic infiltrate. The patient subsequently underwent patch testing to identify potential allergens, which demonstrated positive responses to sodium metabisulphite, used in many cleaning agents, and cinnamaldehyde, which is used as a flavouring agent in a number of foods. The patient then developed laryngeal cord lesions very similar in appearance to the oral lesions, and it was thought that the lesions may be related to occupational exposure to an environmental allergen (such as a component of a cleaning agent). Management initially involved the use of systemic prednisolone in reducing doses, followed by inhaled steroids and steroid mouthwashes, which brought some improvement in symptoms. The application of connective tissue grafts has become a widely accepted therapeutic option in aesthetically oriented periodontal plastic surgery. The harvesting techniques as well as the fields of application have changed and further developed since the first description of a free connective tissue graft three decades ago. This article will provide an overview of techniques for graft harvesting and its therapeutic use as well as future developments. A successful root coverage procedure requires a clearly defined intention. This is illustrated by a control circuit. This means that a controlled variable (therapy) remains directionless as long as the objective (treatment outcome) is not defined. Even though the diagnosis 'recession' is of major importance, it does not solely determine the medical necessity for a surgical intervention. There must be additional findings to ethically justify the surgical procedure. Therapy based on clinical findings is only possible when all evidence-based methods are mastered. The following review focuses on information on objectives, indications and procedures currently present in the literature.